Each year, the U.S. Department of Education disburses around $125 billon in federal financial aid in order to help students access and afford college. When used well, these dollars open the doors to the middle class for students across the country. Unfortunately, federal financial aid does not always pay off. Many students do not graduate; there are persistent attainment gaps by race and income; and institutions may hand out too much debt compared with the return on their education. Sadly, there have even been instances of outright fraud. The Education Department conducts several accountability efforts in the hopes of ensuring that financial aid dollars are well spent. These include gatekeeping requirements, ongoing monitoring, and outcomes-based measures. 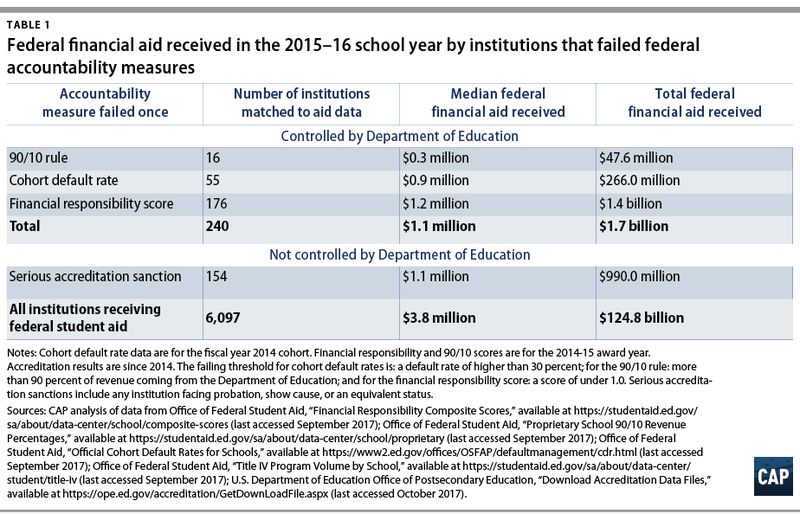 Despite these efforts, very few institutions fail quantitative accountability standards to the point where their financial aid is at risk. The small number of schools that do face aid loss enroll few students and account for a tiny fraction of federal financial aid. The size of federal investments in higher education demands a strong accountability system. Accomplishing that goal will require the Education Department to improve upon what it currently does to oversee colleges and universities in the federal aid programs. 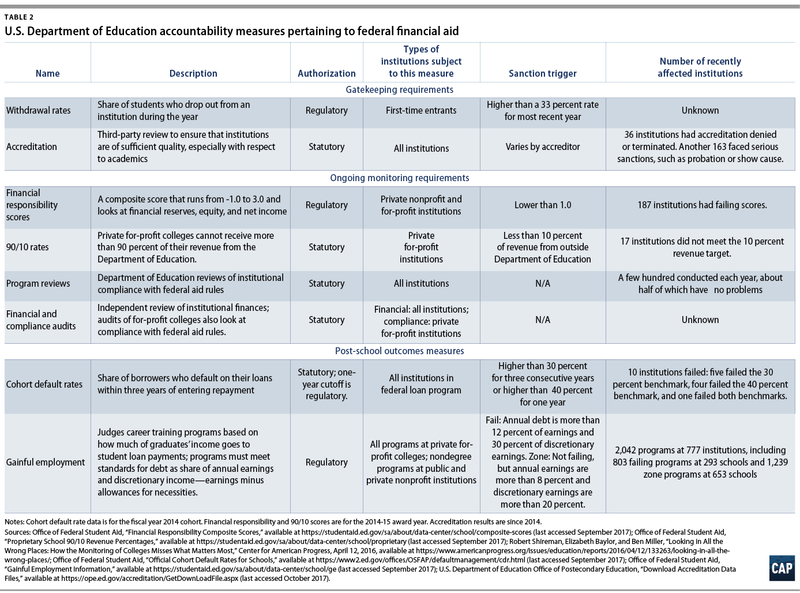 Here are seven principles for strengthening federal accountability for financial aid. Target accountability to the most concerning problems. There needs to be a stronger focus on completion, equity, and student debt struggles. Policymakers could hold institutions accountable for equity gaps, add a measure focused on completion, and improve student loan metrics. Recognize the different roles for gatekeeping, ongoing monitoring, and outcomes accountability. Outcomes matter; however, upfront and ongoing protections do a better job of preventing problems before they arise. Policymakers could improve financial monitoring and clarify accountability expectations for the federal government, states, and nonprofit accreditation agencies. They could also do a more thorough job of reviewing institutions when they change owners or tax statuses. Encourage improvement. Accountability should not only involve revoking federal aid from the worst-performing institutions. Policymakers could reconfigure accountability measures in order to encourage institutions with mediocre results to improve. Use flexible, enforceable consequences. The loss of financial aid is a nuclear option that should not be the only sanction. Policymakers could reconfigure accountability measures to include a range of consequences. This could start with disclosures, followed by financial requirements, before eventually leading to the loss of financial aid. Align consequences with accountability measures. The measures used to judge whether funds are at risk should be connected to those funds’ supposed function. Policymakers could create a separate accountability measure for Pell Grants, rather than judging them through student loan default rates. Policymakers could create bonus systems to reward improvement and excellent results. Differentiate accountability. 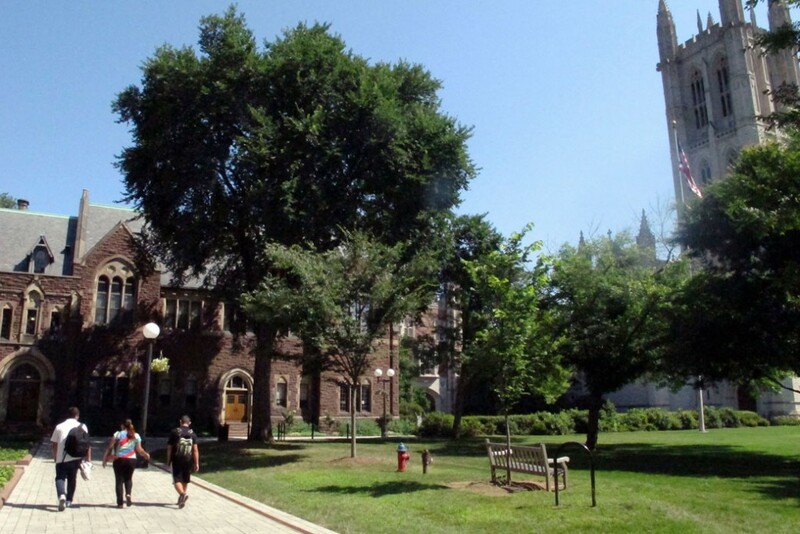 Higher education is diverse; accountability should not be a one-size-fits-all solution. Policymakers could create accountability systems that differ based upon an institution’s size and governance structure but still hold all schools responsible for key aspects, such as student loan outcomes. Ben Miller is the senior director for Postsecondary Education at the Center for American Progress. Mark Hatton is the campaign manager for Postsecondary Education at the Center.